I have been racking my brain on just how I could make THE AUSTRALIAN EASTER HOLIDAY into fun the whole family can enjoy without Charring anything. Well Finally I have found the answer just for you so you can see I do really think outside the box. It all started with a idea that popped into my head as I was driving from the Biochar Industries HQ in Kunghur to Tweed Heads. 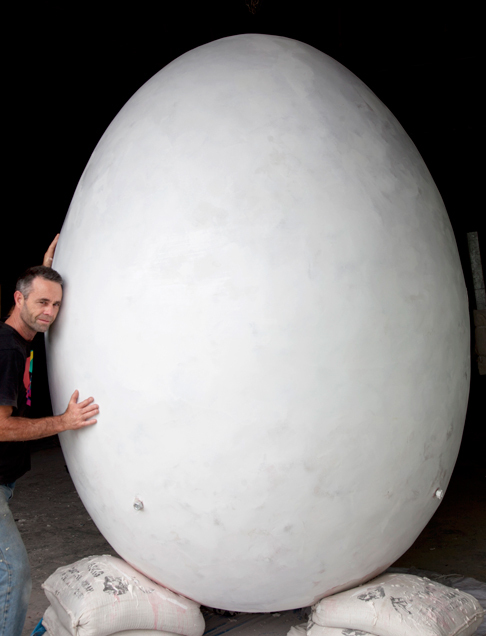 Along the road at about Bray park is a giant white egg that some outside the box thinker has created to keep water healthy. See the photo. So I had this thought how good would it be to make this into an Easter egg. Everyone knows the symbolic link between Easter and the Egg right ? No Ok I will teach you. Easter is a special time when the Easter Bunny travels the land and hands out all the eggs he has laid to people for them to enjoy this freakish event. But wait a minute I hear you say Bunnies don’t lay eggs. Ahh but at this special time they do and they are not chicken eggs they are bunny eggs because they are made out of chocolate. (Very Special time indeed). I think this all came about when Man started to manipulate nature with a science called GM or genetically Modifying and the period of this discovery is called the KA CHING period of the Capitalism ages. OOPPS back to the idea so Easter was almost upon us and I still did not have a gift for all the Biochar enthusiasts out there. 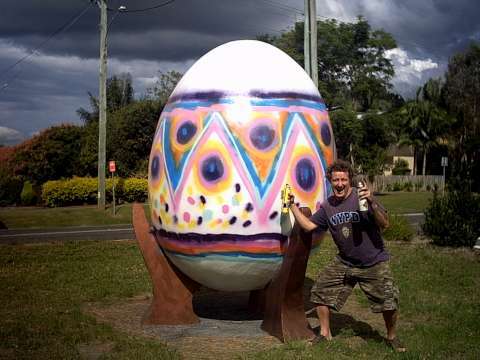 That was until I remembered my Idea just as we were passing the giant egg. BOOM this is what happened NEXT…. Charmaster Dolph and the entire Biochar Industries team. Next post: Biochar gasifier project results from first firing.